"If you found a zombie in a storage locker... would you keep it?" 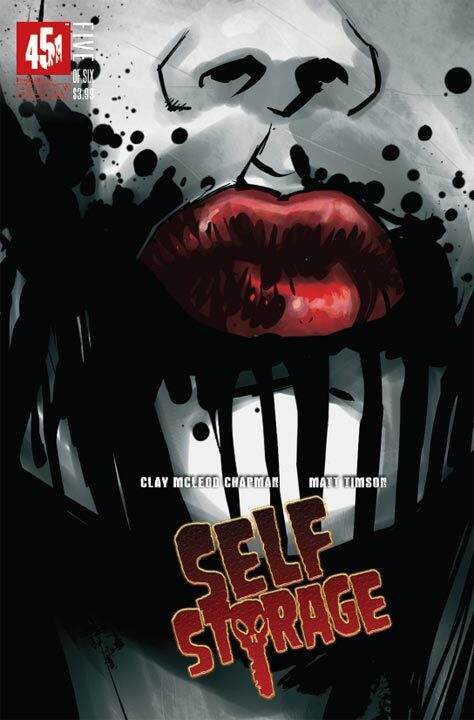 That's the premise of Self Storage put forth by series creator Clay McLeod Chapman and artist Matt Timson. With that beginning they've given us an every man with Chris Smith. He's just a guy trying to get by in life by picking up what others left behind in their storage sheds. Bidding on containers and hoping for some great treasures to pawn at a profit, he buys Unit 83. Instead of potential riches he finds a teenage zombie named Jessica. Once he's purchased this container and finds what's inside he must now find out who put her in there and why. After finding the zombie Jessica some things go very, very wrong and people have died. Chris had to leave the storage facility and he subsequently left a couple less-than-admirable redneck co-workers in charge, and leaving some dumbasses in charge is always a terrible idea. While Chris had been out trying to piece together the mystery behind Unit 83, his coworkers wanted to inject some hilarity into their day by putting the zombies to use. Showing that things aren't all about work for these guys, they played some paintball games with their zombie cargo. Or at least they tried to. Things went sour during their fun and games through the labyrinthine hallways, leading to even more deaths, and a rapidly increasing number of the undead. The sheds are filling up as quickly as the body count. Since leaving his idiotic co-workers in charge, Chris's mistakes have come forward and it's time to pay for them. Last couple issues had some surprising deaths, cranked up the tension, and gave us more of the backstory of what led to Jessica being contained in Unit 83. Self Storage 5 continues the series' tradition of ramping up of the stakes, allowing us a couple moments of levity and humor, then hits us with a high-cost loss of life. And then this issue ends with someone returning to claim what is rightfully theirs from Unit 83. A cliffhanger ending that definitely leaves us every bit as hungry for more as any one of the brain-eating monsters currently locked up in the storage facility. Self Storage is a brilliant handling of the all-consuming zombie genre. It combines the culture of Storage Wars with the horror of The Walking Dead, and adds a dash of comedy right out of Shaun of the Dead. The creators are proving that the undying genre is one that truly will not stay down when used in new and interesting ways. Clay McLeod Chapman has found an ingenious way to provide a wonderfully entertaining commentary on our inability to let things go. Both for those that have died, and for our material possessions- the whole reason public storage sheds were created in the first place. It really makes me wonder, what is the true cost of not letting go? Self Storage 5 will be available May 25th.